Middletown Honda dealership has provided its customers with a great selection of new and used Honda vehicles. 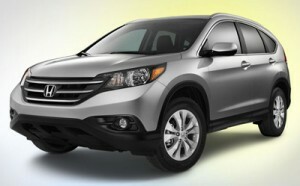 With the all-new 2013 Honda CR-V, you shouldn’t expect anything less than great performance in an aggressive sleek exterior. The Nissan Rogue is also a great contender in its class, having a stylish exterior and a lightweight but powerful engine. While you are considering either the CR-V to the Rogue, let us give you some data to compare some important categories when thinking about buying a car. There’s a lot to be said about what’s under the hood of your vehicle. The Nissan Rogue has a lightweight 2.5L engine that has 170 hp with a fuel economy of 28 mpg on the highway. * Certainly nothing to sneeze at, but not overly impressive either. Furthermore, the CR-V has been rated 5-stars overall in NHTSA crash tests, whereas the Rogue only has a 4-star rating overall, with only 3-stars in front passenger crash tests. While you’ll fit up to five in either vehicle, the Honda features more space, at 104.1 cubic feet to the Rogue’s 97.5 cubic feet of space. Now, that’s a difference you can feel! Let’s face it, you just get more with Honda! Schedule a test drive for our upcoming 2013 vehicles. Contact us today at (845)-343-0055 to speak to one of our knowledgeable sales associates who can answer any questions you have about a particular car you have in mind. You can also reach us online! We look forward to speaking with you!